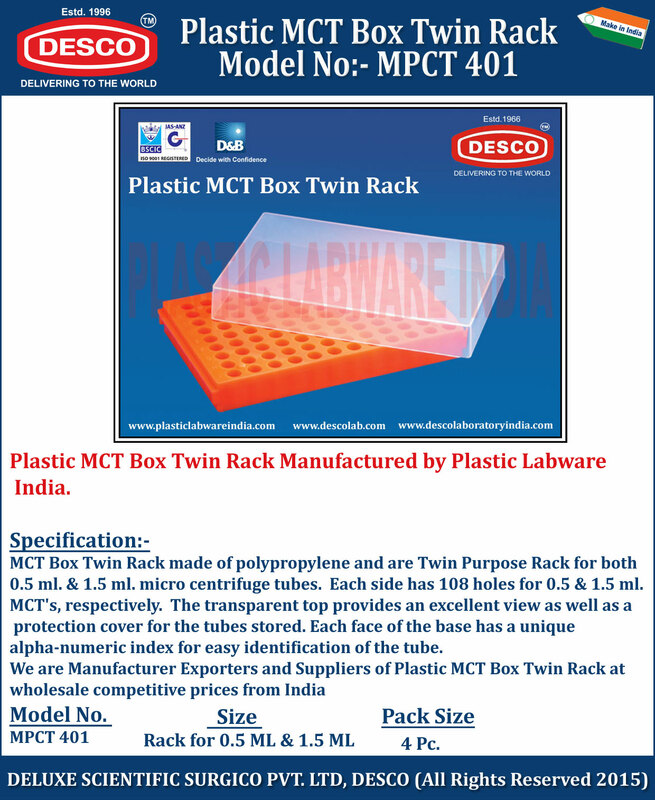 MCT Box Twin Rack made of polypropylene and are Twin Purpose Rack for both 0.5 ml. & 1.5 ml. micro centrifuge tubes. Each side has 108 holes for 0.5 & 1.5 ml. MCT's, respectively. The transparent top provides an excellent view as well as a protection cover for the tubes stored. Each face of the base has a unique alpha-numeric index for easy identification of the tube. We are Manufacturer Exporters and Suppliers of Plastic MCT Box Twin Rack at wholesale competitive prices from India. MPCT 401 Rack for 0.5 ML & 1.5 ML 4 Pc.